Our Top Pick for the best down jacket out there is the Arc’teryx Cerium LT Men’s Hoody. This option provides one of the best warmth-to-weight ratios we’ve ever seen, making it the perfect choice to take along on any hike. This is achieved through the use of the highest quality down, combined with a small amount of synthetic insulation. This is a supreme quality jacket that features a stylish trim cut which will mean you’ll look forward to colder weather and the chance to put the Arc’teryx Cerium on. As our Step-up Pick, we selected the Rab Microlight Men’s Alpine Jacket. While many down jackets aren’t suitable for wet weather, Rab has used a combination of a water resistant fabric outer and specially treated fill, to ensure the best performance, whether you’re hiking in sunshine or showers. The fit of this jacket is excellent too, so if you’re popping into town on a cold winter’s day, the Rab Microlight Alpine will keep you both warm and on trend. Our Budget Pick is the Marmot Tullus Men’s Winter Jacket. This uses a lower fill power than the premium choices out there, but still provides a good level of water resistancy, warmth, and compressibility. The cut is relatively relaxed, providing the best level of comfort and flexibility for your hikes. Available in 4 different colors, this is an excellent choice if you’re looking for entry level jackets which aren’t going to break the bank. Whichever sort of hiking you do, there’s plenty of jackets out there to meet your needs. On a beautiful winter day, there’s little better than going for a beautiful hike to enjoy the crisp air. If you forget to pack the right outdoor gear though, that hike can soon turn into a disaster. As well as choosing the warmest boots, and a pair of suitable hiking pants, one of the most important pieces of equipment for winter trails is a cozy jacket. Many hikers choose to take a down jacket, due to their unbeatable warmth. There’s a wide range of other equipment you’ll want to consider, including a well-stocked first aid kit, handheld GPS, topographical maps, and a survival knife. We also recommend taking a small stove or thermos if you’re heading out for more than a couple of hours. While hiking boots and socks are a vital choice when it comes to winter hikes, so is choosing the best combination of clothing layers to keep your core warm. You might be tempted to select jackets filled with a blend of synthetic fibers. While these look very similar to those filled with down, the difference in warmth makes them incomparable. There’s no synthetic equivalent to down, and once you take the plunge and invest in a down jacket, you’ll never look back. Choosing a down jacket can be a difficult task – we’re here to help you select the best one for your needs. There’s a huge selection out there though, from those designed to keep you warm in some of the harshest alpine conditions, to others which will add a thin layer of warmth under your standard jacket. With such a range of decisions to make before you make your choice, where do you begin? Hopefully, that’s why you’re reading this article! We’ve selected what we think are the best 10 options available today. We’ve purposefully included a range of down jackets to cover a variety of different possibilities. From the best lightweight option for ultralight hikers, to the most durable and hard wearing jacket we could find. This durable, heavyweight jacket will keep you warm during a harsh winter. While all down jackets share the fact that they use duck or goose down, there’s a range of different features that you’ll want to take into account when selecting the best jacket for your needs. Let’s take a look at those now. Down jackets include a wide range of different features, from the type and quality of down used, to their water repellency, and compressibility. How important any one feature is to you will depend on the type of hiking you do, the time of year, and your own personal threshold for the cold. As someone who feels the cold a lot, I know I almost always require a heavier weight option than many other people in the same scenario. With that in mind, let’s take a look at the broad categories that down jackets can be sorted into. This casual choice is just as likely to be worn by city commuters carrying their briefcases, as it is by hikers with their rucksacks. These sweaters tend to have less technical features such as stash pockets, two-way zippers, or hood which will accommodate a helmet. Despite that, they’re often perfect for everyday use and are great for layering. For extreme alpine conditions, this choice probably won’t keep you warm enough, and I would recommend heavyweight down jackets in that case. If you enjoy ultralight hiking or backpacking, then you’ll be used to counting every ounce as you prepare your gear. That means switching boots for trail running shoes, and exchanging your heavy jackets for lighter layers. This is where down jackets come into their own, due to their excellent warmth-to-weight ratio. These jackets reduce weight by using thin outers, with a low denier rating, combined with the use of premium down. They’ll also often feature less pockets, and smaller zips to reduce weight even further. You will need to take a bit of care if you choose an ultralight, as the outer shells are delicate, and reasonably prone to ripping. They’re perfect for layering under a softshell or waterproof. Again, they won’t keep you warm on their own when the temperatures drop too far. If you’re hiking in extreme winter conditions, these jackets will be your friend. They contain far more down than either of the previous two categories. As a result though, they’re not as compressible, and will take up more room in your pack. If you’re heading out in cold conditions though, you’ll know that’s a small price to pay for staying warm! They will often have more durable outers, made from a rugged material to prevent them from ripping or tearing too easily. The construction of the heavyweight brown jacket, and the lightweight black jacket are quite different. The wide baffles of the heavyweight jacket contain more down. If you haven’t ever owned a piece of clothing or camping equipment which uses down, you might be wondering what all the fuss is about. Let’s take a quick look at this amazing natural material and what makes it so special. Down is the fluffy and soft feathers found on the underbelly of birds. This material is naturally insulating, designed to keep birds warm during harsh winters. It looks a little different from a bird’s outer feathers, as you can see in this picture below. The down on the left looks significantly different to the small feather on the right. Thanks to our free range ducks for this picture! A single piece of down looks rather less like a feather, and more like a small collection of fibers. It’s when individual pieces of down are collected together that the magic happens. They form thousands of tiny air pockets, which trap warm air and provide what we call “loft”. As it does on birds, this loft helps to keep us warm when we wear down products. It prevents to cold outside air from reaching your body, and traps the warm air radiating from your body. The down used in the majority of hiking products comes from duck and geese. It’s usually a by-product from birds which are raised for meat. The welfare of these animals is now becoming more and more of a priority for many brands. Practices such as live-plucking and force-feeding are now very much frowned upon. Many brands that use down are now actively taking steps to show that it is as cruelty free as possible. Independent initiatives such as the Cruelty Free Down Challenge, and Responsible Down Standard are now available to help manufacturers gain a certification that rewards and recognizes industry best practice when it comes to animal welfare. As responsible consumers, especially if you’re interested in animal welfare, it’s our responsibility to make sure that any manufacturer of a down product we purchase is able to state the origin of this, and that it’s cruelty free. Many manufacturers will now state this as a matter of course, and we encourage you to delve a little deeper into this subject when making your selection of the best jackets for you. For example, Fjallraven has the highest score within the Cruelty Free Down Challenge, and have fully inspected their supply chain to make sure it meets their Down Promise. Patagonia are signed up to the Global Traceable Down Standard, which is the highest animal welfare standard in the industry. It’s now easy to find out if your preferred manufacturer is signed up to a global initiative, or undertakes their own audits. If you’re not happy with the level of information, we recommend you select a different brand. If you’re hiking in Spring or early Fall, you might just need a lightweight jacket. Late Fall or Winter though, and you’ll need more than that to keep you warm. The warmth rating of down jackets varies, and depends on two main factors: fill power, and fill weight. Selecting the best jackets with the combination of these two factors to suit your circumstances will mean you stay warm, whatever the weather. You’ll see this advertised as a number, for example most jackets we reviewed fell into the 500 – 850 fill power range. This refers to the quality of the down used, with a higher number indicating a higher quality. It’s measured in cubic inches, or CUIN. This also relates to the loft of a particular type of down. One ounce of the highest quality down, 900 CUIN, takes up 900 cubic inches of space, which provides the best amount of loft. As a reminder, loft refers to the fact that down is fluffy, and creates small air pockets. This jacket specified the fill power (listed as loft), down/feather ratio, shell fabric, lining fabric, and features. What’s missing is the fill weight. More and more manufacturers are starting to provide this information as standard. Jackets featuring a higher fill powerl be warm but also lightweight. This is important if you’re looking for the best buy for ultralight backpacking, where weight and compressibility will be your key features. Confusingly though, the same warmth can be achieved by using more of a lower quality down. This is where fill weight comes in as well. As well as paying attention to the fill power, or CUIN rating, you also want to look at the fill weight. The same warmth of a jacket with a high quality CUIN can be achieved by using more of a lower quality down. While it’s not commonplace across the board, more and more brands are starting to list the fill weight, as well as the fill power. If you’re looking for the best jackets for winter, but aren’t so concerned about weight and compressibility, you can save some money by selecting a brand that uses a higher weight of a lower quality. Don’t worry if this all sounds a little complex, as we’ve rated the fill power, fill weight, and warmth of each of the jackets we reviewed, so you can easily decide which one suits you best. While this isn’t as important as the fill power and fill weight, it’s still an important consideration. If you’re looking for an everyday jacket to best suit a range of different conditions then the overall weight probably won’t be your largest concern. On the other hand, if you’re thru-hiking or ultralight backpacking, weight will be a major consideration. Lighter jackets, which use higher quality fill, are more expensive as a result. They also tend to use a thinner outer fabric. This can affect their durability, as we’ll look at next. It’s worth paying attention to the outer fabric that any jackets you’re interested in are constructed from. Ultralight jackets tend to use a light shell fabric, with a low denier rating. This saves on weight, but does make these jackets prone to rips and scrapes. Even a small rip will expose the delicate down, which will start to fall out. The small tear on this lightweight down jacket may begin to spread, exposing the down. Low denier fabric such as this is difficult to repair. If weight isn’t your primary concern, we recommend selecting jackets which use a higher denier fabric. This will impact the overall weight and compressibility, but does mean it’s likely these jackets will last longer and you won’t have to think about replacing them after a hard winter season. Higher deniers, which are more robust fabrics, are indicated by a higher number. A comparison between the low denier fabric outer of the lightweight jacket (on the left) and the high denier fabric outer of the heavyweight jacket (on the right). The cross-hatching of the high denier fabric adds durability, and reduces the likelihood of rips developing. Many jackets come with stuff sacks, or can be stuffed into an inside pocket.This is a great feature as the weather warms up you can stuff your jackets easily into your backpack. Many of the ultralight jackets can compress to a size roughly the same as a Nalgene bottle. Higher fill powers are more compressible, so will pack down to the smallest size. It doesn’t take too long for jackets to bounce back and decompress, just remember to leave them un-stuffed when you’re not going to be using them for a long period of time. This lightweight jacket stuffs into its own inside pocket. One of the common problems with down jackets in the past was if you got them wet, all insulating ability went out of the window. When these small feathers get wet, the fibers clump together. This removes the loft, with the result that any insulating properties are lost. Many of the best jackets nowadays choose to use something called hydrophobic down. This has been treated with a durable water repellent (DWR), which helps it to repel water. This is often combined with a DWR coating to the outer shell. Not all manufacturers use this process, so if you think you’ll be wanting to use your down jacket in scenarios where you may encounter a rain storm, we encourage you to look out for jackets with both a DWR outer, and a hydrophobic treatment. Whether or not you select shortlist of jackets with hoods is really down to personal preference. Many brands offer the same model in hooded and non-hooded version, so you can select the one you prefer. Of course, jackets without a hood will be slightly lighter. If you’re planning on using your jacket to keep you warm at night when camping, then it can be a good idea to get one with a hood. On the other hand, if you prefer using a beanie or other headgear rather than a hood while tucked up in your tent, you’ll be just fine without a hood. I personally prefer non-hooded jackets for the majority of hikes. I do use a very heavyweight down jacket which does have a hood, for the depth of winter. Our pick for the best down jacket on the market today is the Arc’teryx Cerium LT Men’s Hoody. Using an extremely high fill power of 850 means this is both incredibly warm, very light, and super compressible. A major difference between the Arc’teryx Cerium LT and many of the other brands that we reviewed is that it uses a bespoke combination of down and synthetic fill. This unique hybrid combination places the synthetic filling in places that moisture may build up, for example the shoulders and under the arms. This doesn’t seem to impact the excellent ability of the Arc’teryx Cerium LT to keep you warm, and it scored one of the highest ratings for warmth in our review. While it will never keep you as warm as the larger jackets designed for extreme winter conditions, it definitely offers an amazing warmth-to-weight ratio. The outer shell is made of 10 denier nylon, so you will need to take care not to rip it if walking through dense undergrowth or scrambling over rocks. The outer has also been treated with a durable water repellent (DWR) so if you’re caught out in a light shower the warming properties of this coat shouldn’t be compromised. The workmanship of any Arc’teryx product is always impressive, and the Cerium LT is no exception. The stitching is great quality, the hand warmer pockets are a nice touch to keep your hands warm on old days, and the hood is well fitting. While most manufacturers source their down from China, Arc’teryx uses small farms in Eastern Europe. The welfare of the birds kept as these farms is a priority for Arc’teryx, and you can read more in their Down Statement. This isn’t a cheap choice, and is one of the more expensive options out there. Considering the quality of workmanship and extreme warmth of the Arc’teryx Cerium LT Hoody, it’s still our Top Pick. It’s also available in a huge range of 12 colors so you’re sure to find one that you love. It’s quite tricky to stuff the Arc’teryx Cerium into its stuff sack, but once it’s in there it takes up an incredibly small amount of space in your backpack. You will need to take care not to lose the stuff sack, which in our opinion is slightly less practical than having an interior pocket that the coat can be stuffed into (you can never lose that!). The cut of this is on the trim side, as with many of Arc’teryx’s products. So if you’re in any doubt as to what size will suit you best, we recommend you size up. Our Step-up Pick is the Rab Microlight Men’s Alpine Jacket. This is a very close competitor for our top pick, and only lost out due to a couple of small factors. The only real difference between this and our Top Pick, is that is uses a slightly lower fill power, coming in at 750. It is nearly as compressible as our Top Pick too, but does weigh 4 ounces more. This won’t make a big difference if you’re out for a day hike without much equipment, but if you’re ultralight backpacking and counting every ounce, then it’s definitely worth taking into consideration. It also means that although it’s pretty compressible for its size, it will take up more space in your backpack when in its stuff sack. The fit of the Rab Microlight is pretty much perfect – the sleeves don’t feel to short, nor is it so tight that you’ll struggle to put a few extra layers on underneath. One area where the Rab Microlight Alpine excels is in wet weather. Normally, rain and down don’t mix. This choice combats that problem by using a water resistant Pertex Quantum Microlight fabric for the outer. This is also treated with a durable water repellent. The 750 power fill is also treated with NikWax, making it repel water as well. While it’s excellent at repelling a light rain shower, be sure to put a waterproof layer over the top if you’re expecting heavy rain, as no down jackets can be considered truly waterproof. Rab is signed up to the Responsible Down Standard, and uses ethical down sourced from within the European Union. If you’re on a budget, but still looking to experience the benefits of down, then we recommend the Marmot Tullus Men’s Winter Jacket. The down within the Marmot Tullus has been treated with a water repellent, meaning it will still keep you warm in damp conditions. The fit is regular, with a relaxed shoulder and straight hem. Available in 5 different colours, one of the reasons this is a budget choice is the use of a lower fill power of 600. Bearing in mind this is a budget choice, coming in at under $200, it doesn’t provide such a wide range of features as some of the more expensive choices out there. Some reviewers have commented that the down is prone to leaking out of the seams, which will impact the warmth rating if you lose too much. The thin fabric can also easily tear, but this is an issue with many jackets in this category. It’s difficult to find any specific information on Marmot’s website as to where they source their down from, but they do mention that it is certified to Responsible Down Standard. They are listed on the Four Paws Cruelty Free Down Challenge as using Responsible Down Standard certified products. Their score on this site is 7, which is lower than the majority of other manufacturers. That’s definitely something to bear in mind if this is a priority for you. The best down jacket we could find for women is the female-specific model of our Top Pick. The Arc’teryx Cerium LT Women’s Hoody features all the same great features as found in the men’s model. Available in a huge range of no less than 17 colors, this is simply the best option out there for women. Again, the fill power is an impressive 850, the highest we reviewed. This means it is amazingly compressible, easily squashing down into its stuff sack which is just slightly larger than a Nalgene bottle. Within moments of being unpacked, the loft will return to this jacket, and it will look as good as new. 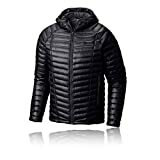 As with the male version, the lightweight of this jacket is achieved by using a combination of a high fill power, with a low denier outer fabric. Care needs to be taken not to snag this jacket on thorns or undergrowth, as the chances are it will tear. The hood is helmet compatible, with an elastic cord at the back to help ensure the perfect fit. The bottom of the Arc’teryx Cerium also has an elastic drawcord so you can pull it tight when you want to prevent cold draughts from entering your coat if you’re hiking in cold and windy weather. As with the male version of the Cerium, Arc’teryx have used a hybrid insulation system, and placed synthetic insulation in areas where the build-up of moisture can be an issue. While this is not a cheap option, if you’re looking for the best of the best, then this is it. If you’re looking for the lightest possible jacket, which doesn’t compromise on warmth or features, then the Mountain Hardwear Ghost Whisperer Men’s Hooded Jacket will likely tick all your boxes. This is by far the lightest jacket in our review, coming in at an incredible 7.7 ounces. For reference, every other jacket we reviewed was 10 ounces and over. This lightness is achieved through a combination of using an 800 fill power, and a thin outer of 7 and 10 denier fabric. This makes for a super compressible jacket which stuffs into its own pocket, creating a tiny package which takes up hardly any room in your backpack. The minimalist design means there’s no reinforcements of the outer fabric in areas prone to wear, so take care to avoid snags or rips to the fabric. The zips are also lightweight, the sleeves use elastic rather than velcro, and there’s no way to adjust the hood. The lack of these features may put some people off, but it’s all designed to ensure this is a truly lightweight option. It may be lightweight, but the fit is still excellent, allowing for a full range of motion at all times. Traditionally, down jackets are not known for their flexibility, but the Mountain Hardwear Men’s StretchDown Jacket breaks that trend. It uses a first-of-its-kind stitchless construction, combined with a stretch knit fabric that allows for a much increased range of movement. The fabric outer is significantly more hard wearing than many of the lighter jacket choices out there, so the StretchDown can take rougher treatment than you might expect. The fit of this jacket is a little on the short side though, which is definitely something to bear in mind if you’re on the taller side. While the outer of this jacket is treated with DWR, and the fill hydrophobic, its water repellency is distinctly average. The Mountain Hardwear StretchDown does offer a subtle jacket choice with nice, understated branding. The fill is responsibly and ethically sourced which for us, is an important factor. Some of the features in this jacket are a little lacking though. It’s rather heavy, and unfortunately doesn’t come with either a stuff sack, or the possibility to roll it up into a pocket. The hood has no drawcord which makes getting the perfect fit a little tricky, especially in windy weather. That said, it does offer a good number of pockets, with an impressive 5 in total. If you love the outdoors, but also have children, it’s likely you’ll want to take them on at least some of your adventures. If you’re looking for a down layer for your kids, we recommend the Marmot Boy’s Guides Down Hoody. The 700 CUIN of down within this jacket is treated using Down Defender, a durable water repellent (DWR) which is applied at the same time as the down is cleaned. The Marmot Boy’s Guides Down Hoody has zipped hand warmer pockets, a cozy hood, and clastic cuffs. The zippers for the main zip and pockets are chunky, with pull ties. This makes them easy for little gloved hands to use. This option has positive reviews on both Amazon, and the Marmot website itself. It provides all the quality you’d expect from the adult version, just in a smaller package. The ripstop polyester outer is perfect for kids, we all know how they love to run through the undergrowth in search of adventure. With this tough ripstop fabric, you won’t have to worry about brambles or tough branches ripping the fabric. The Angel-Wing Movement™ of the arms means your kid has a full range of arm movement without ever feeling restricted. This guarantees the perfect snow angel – every time! Our suggestion as the best down jacket for everyday use goes to the Patagonia Men’s Down Sweater. As a best-selling item, you’ll be just as likely to see this jacket on the streets of New York as you are on the slopes of your ski resort. Patagonia uses the best quality materials, including a hard wearing outer shell made from a combination of 30D and 20D ripstop polyester. As a bonus, the polyester is recycled! While this isn’t one of the warmest jackets we reviewed, we think it offers one of the best warmth to weight comparisons we’ve seen. This makes it super versatile for a range of different weather conditions. The outer is treated with a Durable Water Repellent (DWR) meaning this does a good job of keeping you dry in a light shower of rain. This jacket stows away into one of its pockets, meaning there’s no worry about losing a stuff sack when it comes times to pack this away. The Patagonia Men’s Down Sweater comes in a choice of 4 colors, including red, gray, green, and black. As a brand, Patagonia is well known for both their quality workmanship, and commitment to great customer service. Their Ironclad Guarantee covers returns, exchanges, and repairs. The fit of this option is quite boxy, so that’s something to bear in mind. An advantage of this is that it fits well over layers, which is perfect for hiking. Some people prefer a more fitted jacket, especially if you’re wearing it over just one or two thin layers. This jacket ticks many other boxes though, so in my opinion this isn’t an issue at all. Our pick as the best choice for winter adventures is the Rab Neutrino Men’s Endurance Jacket. The generous fill of 8.8 ounces of 800 CUIN of goose down means this is one of the warmest options out there. This warmth is combined with an outer made of Pertex Endurance, which provides resistance to both wind and water. The hydrophobic down also adds another layer of resistance, should you be caught in a heavy downfall. The premium quality YKK zippers of this jacket are also treated with a polyurethane finish, which increases water repellency even more. The Rab Neutrino Men’s Endurance is a heavy choice, coming in at 22.4 ounces. 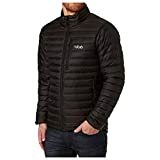 As well as the high amount of down, this jacket also uses a 30D outer, which is heavier and more durable than many of the lighter denier nylon outers that jackets designed for slightly warmer weather may be made from. The hood is designed to fit over helmets or beanies, and stows away into the collar when not in use. It also has a flexible polymer wired peak. Due to the fact that Rab is a brand from the United Kingdom, you’ll find the zip on the left hand side of the zipper, which can take a little while to get used to. This jacket is available in a wide range of 7 colors. It also comes with a stuff sack so you can compress it down, and pop it in the bottom of your backpack until the temperatures start to drop. Rab follows guidelines put in place by the Responsible Down Standard, meaning their down is sourced from ducks and geese which have been treated well. Some down jackets are created from a relatively thin nylon outer, which can sometimes be prone to tears if you’re hiking through dense undergrowth. If you’re looking for a truly durable down jacket, then the Fjallraven Men’s Ovik Jacket is our suggestion. For this down jacket, the outer lining is made from a blend of cotton and polyester, which Fjallraven call G-1000. This is much more heavy-duty and durable then the nylon outer that many other brands use. As an additional bonus, the G-1000 outer is windproof, as well as being mildly water resistant. If you want to increase the water repellent properties of this jacket, you have the option to add a layer of Fjallraven’s specially formulated Greenland Wax coating. Instructions for how to apply the wax can be found on Fjallraven’s website. The Fjallraven Men’s Ovik includes features such as a fill of 500 CIUN down. There is also a two-way zipper, which is hidden using a protective flap secured by press buttons. The inner protective flap includes fleece at the chin area. The hand pockets are secured with buttons, and include a cozy fleece lining to help keep your hands warm. There are also two inner pockets for storing small items. The sleeve cuffs have elastic and a press button, for the perfect fit. The hood is not only adjustable, but removable too. While this is not a cheap option, it is heavyweight and durable. Fjallraven use only fully-traceable, high quality down in their products, following the implementation of their Down Promise. We’ve looked at all the features you should pay attention to when selecting the best down jacket for your needs. We’ve also rounded up the 10 best options we can find, but let’s take a closer look at some of their features side by side. While we think our Top Pick is the best out there, you may be looking for some specific features, such as durability, or weight. It can be helpful to compare all the products we reviewed side by side, so you can select the best one for your needs. Whether you’re looking for the lightest choice, or the one with the best fill power, we’ve got you covered. First of all, we looked at the overall weight of each option. Unsurprisingly, the two heaviest options are the Rab Neutrino and Fjallraven Ovik. Both of these are designed as very warm options for winter conditions. The lightest choice is the Mountain Hardwear Ghost Whisperer, which weighs far less than any other jacket we reviewed. The weight of any jackets you’re considering is definitely a factor if you’re ultralight backpacking. If you’re not, we recommend prioritising warmth and compressibility. Next up, we looked at the fill weight of each jacket that we reviewed. 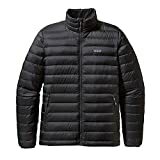 A higher fill weight can indicate that a lower fill power has been used, but it can also indicate that a jacket is designed for winter conditions. Two of the options we reviewed, the Marmot Tullus, and Marmot Boy’s Guide, did not indicate a fill weight. The majority of those we reviewed fell into a similar bracket of between 3.2 – 5 ounces of fill. The one choice that fell outside this was again, the Rab Neutrino which is designed for harsh conditions and therefore has a higher fill weight to keep you warmer. Also important to consider is the fill power of each jacket. This indicates the quality of the down used within the jacket. 900 CUIN is the highest fill power available. Both Arc’teryx jackets used an extremely high quality fill power of 850. As you might expect from a budget option, the Marmot Tullus used one of the lowest quality fill power. The only jacket with a lower fill power was the Fjallraven Ovik, which uses a higher fill weight to compensate for this. Next up, we looked at the water resistance of each of the jackets we reviewed. Historically, down and water do not mix. But advances in technology mean many manufacturers have now decided to use a combination of both fabric outers treated with a durable water repellent, and down which has been treated in order to repel water. This means the water repellency of many of the options we reviewed was in fact fairly good. The best we found was the RAB Microlight. Durability is also an aspect which you should consider. Many of the options we reviewed use a low denier polyester fabric outer, and these can be prone to ripping or snagging. As you might expect, the choices with the best durability were the Marmot Boy’s Guides Jacket, and the Fjallraven Ovik. Both of these are expected to be exposed to more wear and tear than average, hence the higher denier fabric and increased durability. Next up, warmth. Depending on what season you tend to hike in, you should select a jacket to suit this time of year. Some winter options will definitely be too warm for spring or fall, so that’s an important consideration. All options we reviewed provide an excellent level of warmth. We recommend the Rab Neutrino for winter only, as it’s the warmest of all that we reviewed. Lastly, we scored the compressibility of each jacket. This isn’t necessarily your main consideration if you’re planning on fairly short hikes only. It can be annoying to carry a heavy, not very compressible jacket such as the Fjallraven Ovik though, if the weather suddenly changes and you find yourself too warm. The majority of options we reviewed will compress into a small stuff sack, or fold into one of their pockets. Both of the Arc’teryx Ceriums, and the Mountain Hardwear Ghost Whisperer, were the most compressible and therefore excellent if you’re looking for something that will keep you warm, but not take up too much room in your backpack when you choose to take it off. The huge variety of down jackets on the market can make it difficult to choose the best one for you. We looked at a range of different brands which didn’t make it into our top 10. Some of these used a blend of down and feather, others didn’t state what source their materials came from and whether they were sourced from ethical manufacturers. With the right choice of jacket, you’ll enjoy your hike, whatever the weather. It can be a risk purchasing a high value product such as these jackets, without having seen or felt it. Some products look excellent in online photos, but when you place your order and open your parcel, you can immediately sense that the quality is not the best. Instead, by using a review such as this, you can rest assured that we’ve covered as many options as we can to make sure you’ve got a wide range of options from some of the best brands out there. As we reviewed the options on the market today, it was an easy choice to select the Arc’teryx Cerium LT Men’s Hoody as our best pick. It offers an incredible ratio of warmth-to weight, combined with a stylish trim cut and the highest quality fill power we’ve seen in our review. The impressive compressibility and light weight also means you can throw this in your backpack and forget it’s there until you really need it.